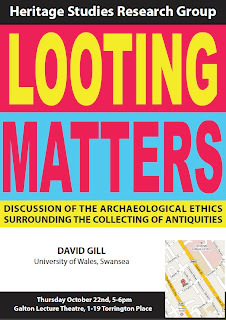 The Looting Matters debate with the Heritage Studies Research Group of the Institute of Archaeology starts at Thursday 5 pm in the Galton Lecture Theatre, Torrington Place, London. What are the breaking issues? Good luck. I don't know about "breaking issues", but "festering wounds" would be to address the ethical issues of British archaeologists in "partnership" with so-called "Metal detecting" in the UK. This very much clouds the issue over artefact collecting in the UK. The lecture was very interesting and an eye opener. There are still a lot of issues and problems about looting of artefacts. Its good that this is been brought to attention. It was a great lecture and I learned immensely more about what you've blogged about with such vigor. It was a pleasure meeting you! Gill, David W.J. "Looting Matters for Classical Antiquities: Contemporary Issues in Archaeological Ethics." Present Pasts 1 (2009): 77-104.